This comes despite both Septembers facing large hurricanes, Harvey in 2017 and Florence this year. 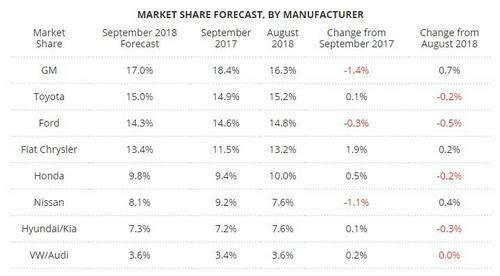 Jeremy Acevedo, Edmunds' manager of industry analysis, stated: "Vehicle replacement demand following Hurricane Harvey bolstered auto sales last September, and Hurricane Florence has had a very limited impact on auto sales this month, which are the primary reasons why we're seeing this year-over-year decline. With that said, a SAAR of 17 million is certainly not an unhealthy number — September is still shaping up to be a robust month for sales." The SAAR pushing above 17 million is likely a product of increased incentives which were cut sharply in recent months, and dealers getting ready to navigate sell-downs for the most recent model year, according to the report. Acevedo continued: "Labor Day sales typically help get the month of September off to a solid start. Now that we're heading into the fourth quarter and more 2019 model year vehicles are making their way to showrooms, automakers and dealers are likely making more of a concerted effort to address lagging inventories." Edmunds estimates that retail SAAR will come in at 14.4 million vehicles in September 2018, with fleet transactions accounting for 15.2 percent of total sales. 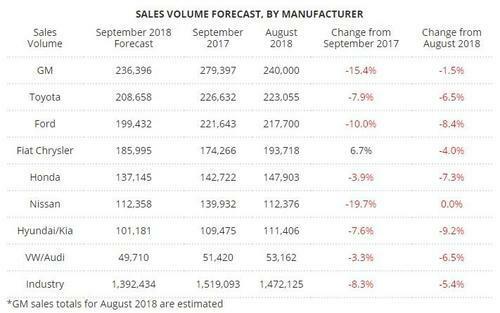 An estimated 3.3 million used vehicles will be sold in September 2018, for a SAAR of 39.6 million (compared to 3.4 million — or a SAAR of 39.7 million — in August). This comes after we reported a sharp decline in deliveries back in July, even on the heels of pervasive discounts. Back then we suggested that these incentives were the dynamo that drove purchases to a plateau of between 17 and 18 million units over the past three years to begin with. It increasingly appears that this may have been the case. The drop in sales capped another rough month for the auto industry during which Detroit’s carmakers all revised their earnings guidance lower and Ford embarked on a five-year restructuring plan. Earlier this week, we reported that Ford's CEO claimed that President Trump's auto tariffs had cost the company $1 billion in profits. 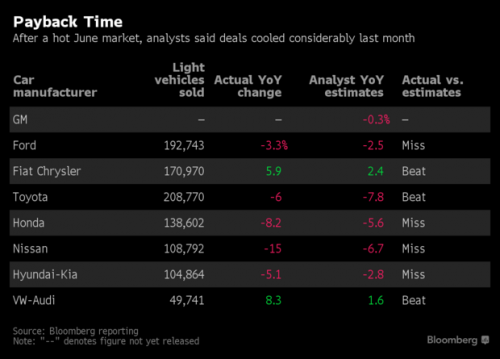 Additionally, as Bloomberg added, the July month "will [have] underscore[d] investor fears that auto sales have peaked and that, without ever-higher sales incentives to keep consumers interested, demand will continue to soften."